Spectacular right? Just in time for spring’s premier, my Magnolia ‘Butterflies’ has graced our yard with hundreds of fragrant yellow blossoms. If you stand 100 yards downwind of it, the sweet scent of all those flowers is still powerfully present. 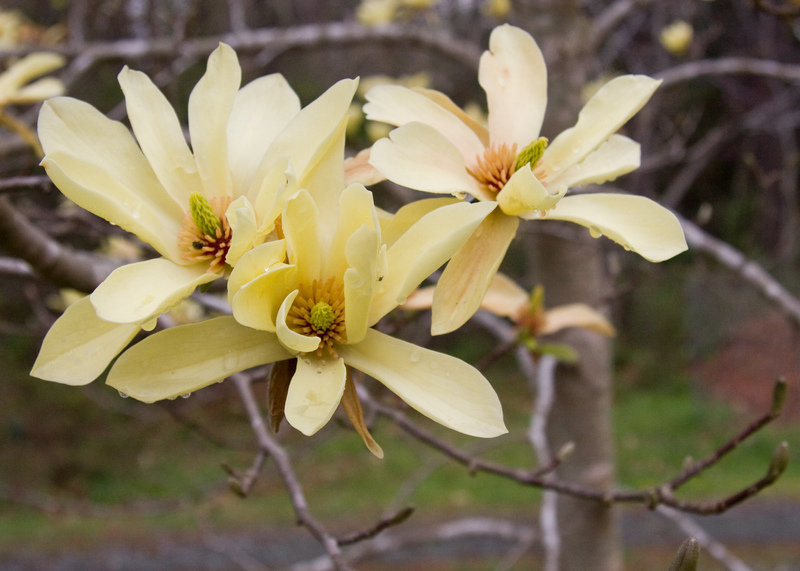 This Magnolia cultivar is a cross between M. acuminata and M. denudata. The flowers are 3-5 inches across (mine are closer to 5 inches), and the tree matures to an estimated height between 18 to 20 feet. I got mine as a tiny foot-tall plant from the Brooklyn Botanic Garden as a one-free-plant-a-year benefit of membership about 17 years ago. Since I doubt I’ll ever make it to that garden, I now am a member at the level that provides me only with the fabulous handbooks they produce every year. In those early years, I acquired several other choice plants from this fine institution; I’ll tell you about those another time. 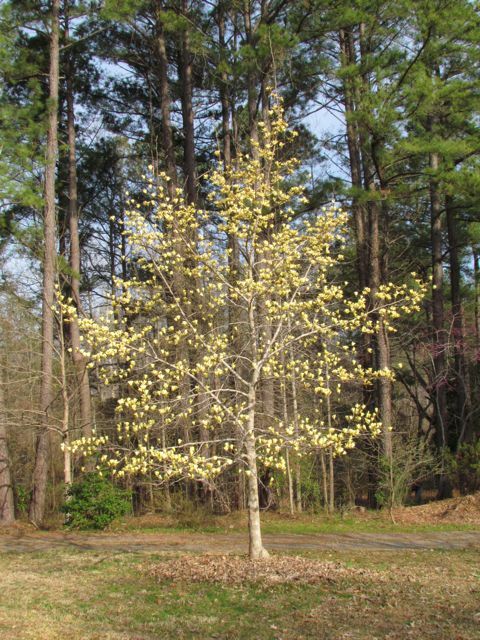 Because the flowers bloom before its leaves emerge, the tree really pops in the early spring landscape. Southeast Piedmont gardeners should know, however, that some springs are kinder than others to this early bloomer. More than once a late freeze has completely zapped the flowers just as they opened, turning bright yellow petals to brown overnight. But for me, this breathtakingly exquisite tree is worth the gamble. When my 20-foot-tall tree is covered in hundreds of fragrant yellow blossoms, I know spring has sprung. This entry was posted on March 20, 2011, 10:20 am and is filed under Favorite Plants, piedmont gardening. You can follow any responses to this entry through RSS 2.0. You can leave a response, or trackback from your own site.